In 1970 the cookbook to buy was the new and updated Betty Crocker with the red cover. I got one the year I finished senior Home Economics (which I took instead of physics) 😅 In this class we learned sewing, knitting, cooking, and kitchen design — skills I have used throughout my life. Physics would never have been so practical. Not to mention that I would have never gotten a A in physics. It is not that this is the best cookbook in the world. By far…. but it’s comfortable. Joy of Cooking is austere, though I use it in a pinch; other favorites — The Hay Day Country Market Cookbook and Moosewood Cookbook are lovely and artistic but just don’t have the range of recipes. When we moved two years ago I went through all my cookbooks and discarded some, but I still have 33 cookbooks — including one that is a notebook of recipes written in my grandmother’s hand. I have no idea — is 33 cookbooks a lot? How many cookbooks are on your shelves? At least half of these I’ve gotten at library book sales for just a dollar or so. The other half have been gifts to me. Yes. I can always use and love a cookbook. But my point in all this is to say that I — who love cookbooks — just don’t use them much anymore. I can go to the internet, type in my ingredients, and Voilá — there is the recipe for dinner. And if it turns out swell, then I bookmark it. My online recipe bookmarks are neatly organized into Breakfasts; Breads; Desserts and Sweet Snacks; Jams, Pickles, Snacks & Condiments; Main Dishes; and Vegetables, Salads & Soups. My physical cookbooks are not so well arranged. But when I want something new, do I open a cookbook and browse? No. I browse my favorite food blogs: Foodie with Family; The Clever Carrot; Pioneer Woman; The Catholic Table; or just browse Yummly for what looks the best. No matter; when I die, I will still have lots of cookbooks. And my kids can take the ones they want. Or give them to the library book sale. Combine all ingredients, including melted butter/oil and mix. *The cast iron skillet is my addition, but it is non-negotiable. It makes all the difference. Plus then you can cut the cornbread in cool wedges instead of boring old squares. You’re welcome. I put it into a hot cast iron skillet–for a heftier crust…oh, and I throw in a carmelized onion and hot peppers. Perhaps I lived too long in California. Caramelized onions, yes. Hot peppers, no. :-) Maybe green peppers? Actually if you are familiar with that cookbook there’s a recipe that is very similar to the cornbread that she calls green pepper and onion shortcake…And oh yes, to a hot pan! I have a cast iron cornbread pan that is divided into ‘wedge’ shapes 😄 love it! My cornbread recipe is almost the same – but I use plain yogurt instead of buttermilk. I’ve seen those divided pans and thought ‘how cool — then everyone can get an edge!’ I used to have an old cast iron “corn stick” pan that looked so cute and was such a good idea, but I could never get the corn sticks to come out in one piece. The divided pans are a much better idea. A square cast iron pan! I’ve never seen one. Now I have pan envy…. So I have the BHG plaid cookbook as my go-to. My kids have used it so often to make pancakes and waffles that page 86 is almost illegible. I also have The Big Book of Cookies and the sugar cookie recipe on page 72 is in same condition. I just counted and I have 17. One is called “Cooking in Ardmore”. It’s the 1947 Junior League recipe collection from Ardmore, Ok. My grandma is in it twice, along with my great-aunt and my great-grandma, all under their husband’s names. I keep it for her handwriting in the margins, but it’s tough to cook out of because it calls for things like Oleo and tells me to bake the cake in a “medium oven”. Also I think some ingredients have changed in the last 80 years, like baking powder or the consistency of flour because things come out just a tad off. It’s a nifty piece of history though. We cannot give up our books, cookbooks or otherwise! Ok, I need copies of Nanny’s hand written recipes! Cornbread in an iron skillet is a must. Actually the only one you might want is the ham loaf recipe…. and I think it’s the same as Mom’s. Her oatmeal raisin cookies are not in there! I now only have one cookbook, More with Less. Although I have several food biographies that include recipes. More With Less was my go to cookbook when I was raising my kids. Alas, it fell apart. I never replaced it, but I was so delighted a few years ago when I saw it was back in print… I may have to add to my shelf…. Thanks for reminding me! There is a new, 40th anniversary edition just published. Edited by Rachel Marie Stone. I love my cookbooks, but I also find a lot of recipes on the internet. There’s an app called Copy Me That, that I copy the recipes I make from websites or cookbooks so they’re more accessible later. My phone is an older iPhone and it is getting crowded, so I haven’t added any new apps lately. My problem is I have too many photos. I took some off, and made some extra room, but still I’m being cautious. Although that sounds like a great thing to have! I seem to collect cookbooks. I get hooked when perusing the pictures! ☺ The cornbread recipe sounds delicious! 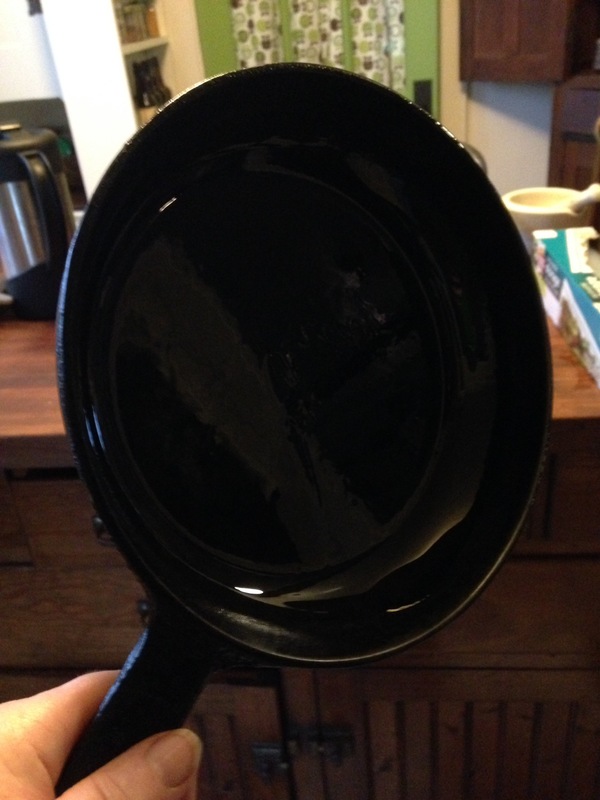 I shared a blog in February about the best way to seasoning a cast iron pan. I started out cooking from the book “Laurel’s Kitchen” when I was in high school. I remember making yogurt on a heating pad in sterilized peanut butter jars. I just dated myself I know, maybe I will always be old school, but I still love to work from a cookbook.